Summary: At four hundred pounds, Billy Brennan can always count on food. From his earliest memories, he has loved food’s colors, textures and tastes. The way flavors go off in his mouth. How food keeps his mind still and his bad feelings quiet. Food has always made everything better, until the day Billy’s beloved son Michael takes his own life. Despite his crushing detractors, Billy gains welcome allies: his community-at-large; a co-worker who lost his father to suicide; a filmmaker with his own dubious agenda; and a secret, miniature kingdom that Billy populates with the sub-quality dolls and soldiers he rescues from disposal at the local toy factory where he works. But it is only if Billy can confront the truth of his pain, suffering, and the brokenness around him, that he and others will be able to realize the full rescue and change they need. 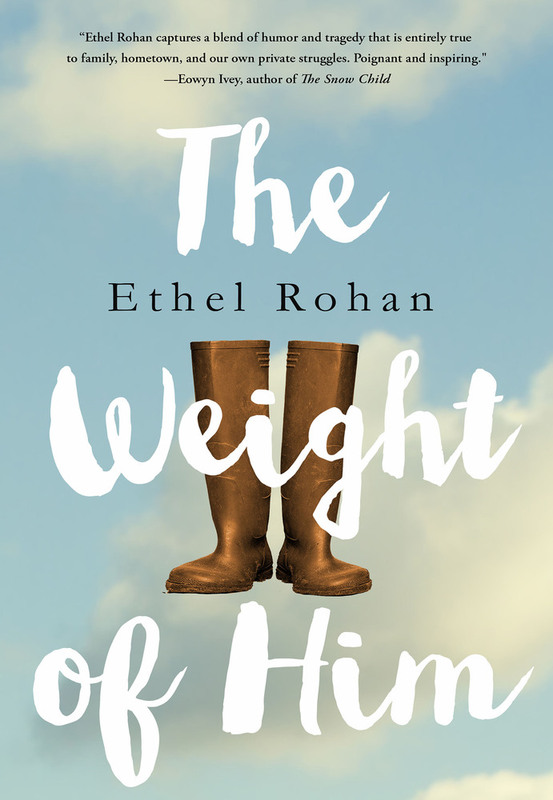 I am horribly remiss that I haven't reviewed THE WEIGHT OF HIM by Ethel Rohan before now. I read this novel a few months ago and really enjoyed it. Unfortunately, my spring was totally crazy and now it's summer... and well, I'm finally getting around to reviewing it. THE WEIGHT OF HIM tells the story of Billy Brennan, a husband and father who just happens to weight over 400 pounds. Billy has an interesting relationship with food -- he loves it; and frankly, it acts as a comfort to him, especially now that he's lost his son Michael to suicide. After his son's death, Billy decides he wants to make a difference in the world. He is determined to lose weight, in a very public setting, and in the process, raise money for suicide prevention. His family isn't quite standing behind him like he had hoped. They just want to move on and try to exist without Michael -- not call more attention to it. Billy does have his fair share of supporters, though. He meets some special people who truly appreciate his efforts like another man who lost his son to suicide. However, Billy is still struggling with his own demons and his journey isn't easy. Billy must accept the loss of Michael before he can truly live again... and make a difference in other's lives. THE WEIGHT OF HIM is really a special novel. You will fall in love with Billy and his earnestness, and I'm pretty sure this novel will warm you heart. That's not to say that much of this book isn't painful because it does deal with a man's loss of his son and his doubts about what he could have done differently. However, ultimately, I think this novel's message was about strength and resilience... and the difference one person can make in the world. I didn't mention that this novel takes place in a small Ireland village. I am a huge fan of books that take place in Ireland, and this book reminded me why. I loved the quirkiness of the community as well as the author's descriptions of the town. Ms. Rohan did a great job of bringing the setting to life, and I loved visualizing Billy's home. I have to commend the author for writing such a beautiful novel, and I loved the way she captured the essence of so many larger themes. For example, Billy's losses -- both his son and half his body weight -- were major themes throughout the novel. However, she was also able to show, through Billy's character, the importance of never, ever giving up. It was an interesting juxtaposition to Michael's suicide. Finally, I loved the hope in the novel -- not only Billy's determination in his weight loss but also his determination to make sure Michael was never forgotten and to help others. I do think THE WEIGHT OF HIM would make a terrific book club selection. I wasn't able to find a reader's guide, but I don't think you need a formal one. There are so many important themes to discuss including family, devotion, love, guilt, and perseverance. In addition, I think this is novel gives an honest look at the many different ways grief can manifest itself in people. However, you will also want to talk about the meaning of the title as well as the many different ways loss is incorporated into the story. Overall, I think THE WEIGHT OF HIM is a well-written novel that will both touch your heart and make you smile. Highly recommended! I've never heard of this book before but it sure does sound like a must read. I agree with you. I liked it a lot too. And I just reviewed it a week ago - The Weight of Him by Ethel Rohan (our November RBC author). I am fortunate that she has agreed to be an RBC author. She will be coming to our book club in November. I am looking forward to meeting her...and hearing her accent!